This post features three of the things I love (the first of whom I’ll meet this week in St. Paul): tiny little Georgia, Reid, and inland fishing from my kayak. If there was a photo or other mention of Ellen tucked in here, then you could round it up to four. Ellen/Reid: Well, Reid, it looks like you’re going to have two adoring little nieces. 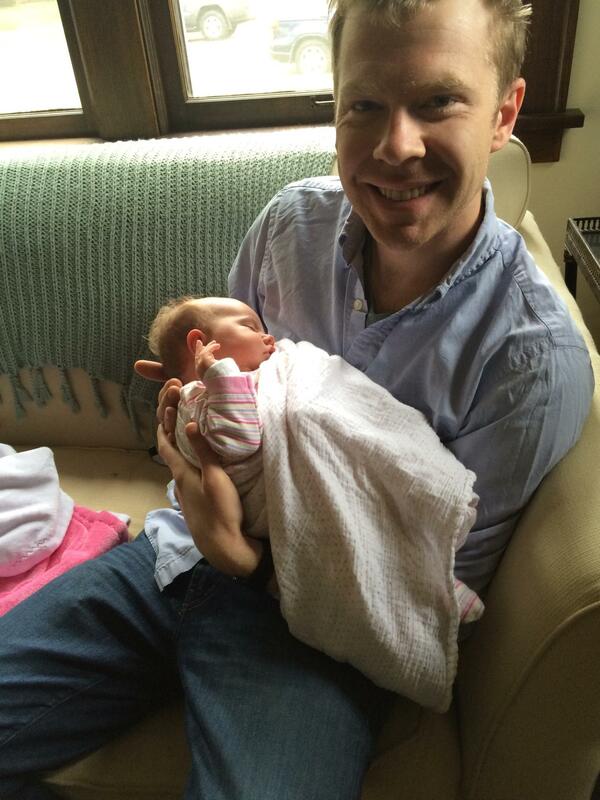 But you’ve got to work on this infant holding thing. You didn’t look entirely comfortable. That’ll come with practice. Not that there’s a hint there. Georgia looks comfortable with her uncle Reid, but his grip looks like it needs some work. I changed out the heavy brown comforter for a warm weather version last week and that’s when it dawned on me that I have no – zero – sense of style/decor. The lightweight one is robin egg blue and it clashes, to put it mildly, with the brown tones of the cherrywood bed and carpet. I need some guidance on such things. It kind of goes hand in hand with the utter lack of style in the first floor living room, and probably extends to my jeans and tees, too. But at this point what the hell. It is what it is. I’m still sore this morning from a tough down-and-back day trip on Friday to fish near Charleston. I hit the road about 4 a.m. for the three hour-plus drive. The intent was to put in about 8 a.m. but got caught in some dead-stop traffic just north of Charleston which cost me most of an hour. A tropical storm loomed offshore and it pushed a heavy counterclockwise wind inland. 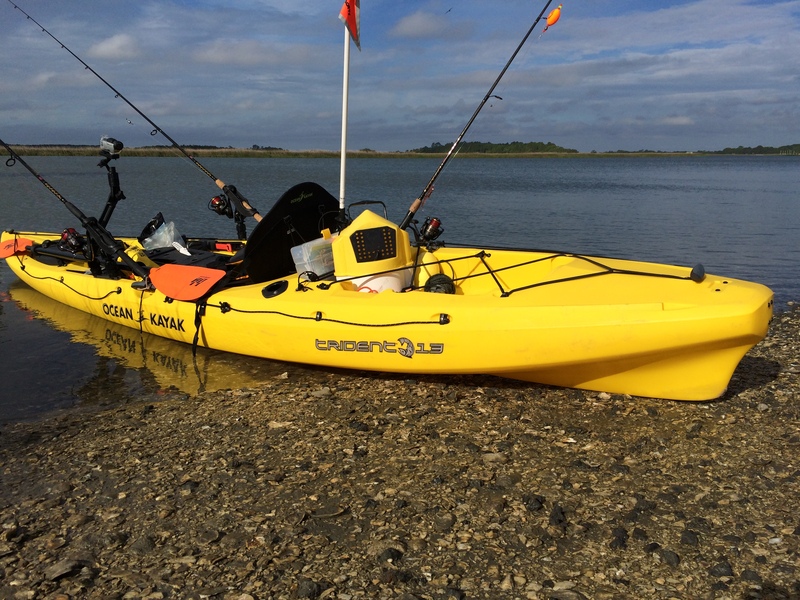 It was very hard to paddle against, and a strong tide exacerbated things. It was everything I could do to make headway. It seems there’s a little more gear each time I set out. But if it means catching fish, yeah, bring on the stuff. The guys at the put in point said the fishing would be slow, and they were right. Had a few bites early but then nothing for a few hours. So I roamed over to a huge grass flat that looked promising but didn’t see any tailing in a foot of water or so. Reid, I hit the barge about 2:30 and wasn’t there too long before a guy pulled up in his boat and anchored roughly where you sat when your big spot hit. Both of us were using cut mullet. His name was Jim, and he’s there with some frequency since he only lives a mile or so away and he had three lines in the water. He predicted we’d hit the fish quickly. But for the better part of another 60 minutes neither of us got anything other than a few nibbles, sheepshead most likely. He thought the pressure of the storm had an impact. When he learned I had some mud minnows, he suggested I ditch the mullet and hook the minnow through the upper lip about two feet below a bobber I had already rigged with a DOA shrimp and flip it toward shore in about a foot of water. Sure enough, the bobber went under and the line just stripped from the reel. What a sound/sensation that is. It felt like a spot from the get-go. About a 16 incher, just inside the slot. Onto the stringer it went although to be honest, there was a pang about letting it live. It was such a pretty fish. There were another couple strong strikes but nothing more came of it other than a minnow sacrificed for the sport. It wasn’t much later when a strong squall moved in and it rained like hell. It was a wrath of God rain and wind. Jim took off after offering to pull me in to the dock, but I declined to instead wait out the deluge. About 30 minutes later it stopped but there were no more fish. So I labored back to the marina, my fish in tow about 5 yards behind the boat. It takes about an hour to get the kayak back atop the car and everything hosed down with fresh water and stowed. The stringer was tied off to a rock as I prepped the boat for the car ride. The debate about a free/non-free fish didn’t last very long. The Bowens Island restaurant is a must-visit deal near Folly Beach. Not high cuisine, but a funky place with good views and great beer. My fishing spot is on the horizon just above the diners. Since I’ve paid some pretty heavy dues on this and past trips, the red was hurriedly filleted it and frankly I didn’t do a very good job. But it went on ice and that was it. The little seedy restaurant next to the put in was open, and I changed clothes in the car and went up for a beer and some fried shrimp. 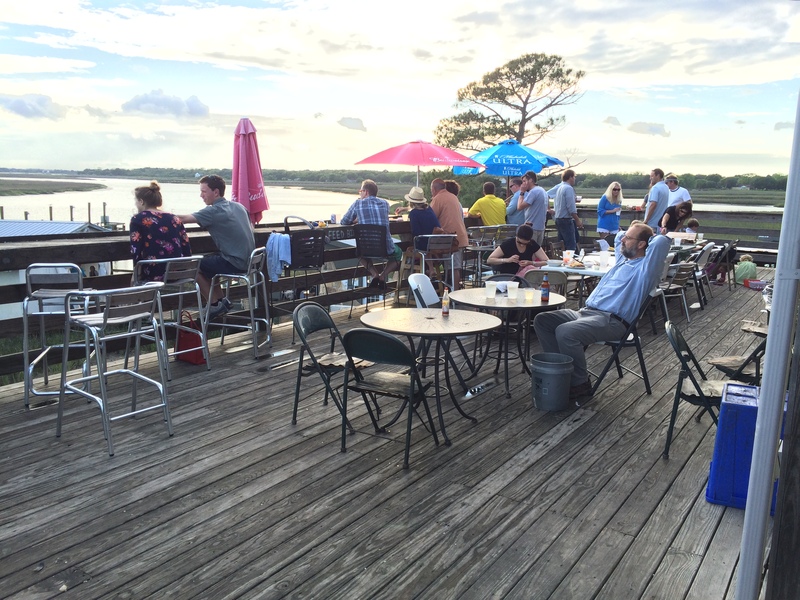 The joint was packed with locals and was a lot of fun with good views of the waterway. If you guys ever come down this way, we’ll visit it. If you wear anything other than the aforementioned jeans and tees, you’ll be overdressed. But it made for a long, long day. I pulled into the garage about 12:45 a.m. and it took 30 minutes to unpack everything and stow the boat. I told myself this was the last time for such a jaunt. But the itch will return soon enough. 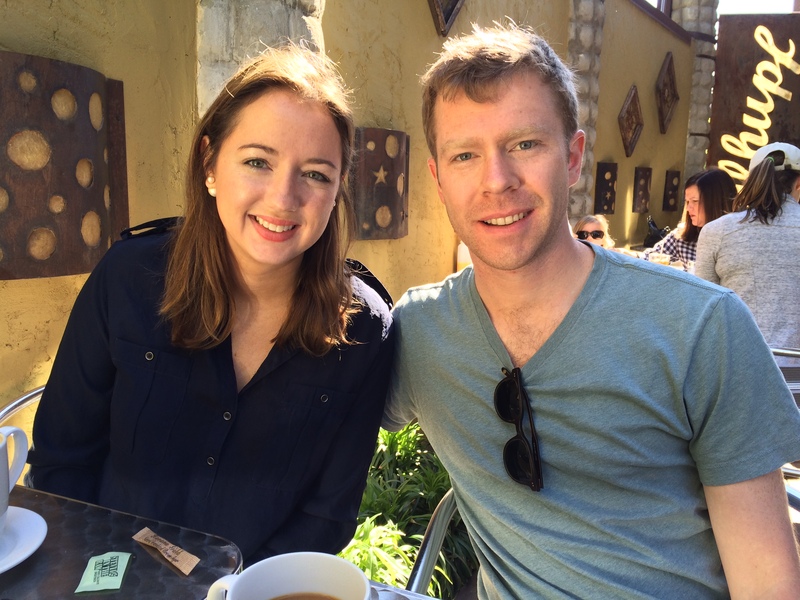 Hadn’t seen Reid and Liz in a while, so it was good to get over Durham way for brunch. Sure, sitting down with those two was the highlight but every so often you come across a human situation that can’t help but impress. Ellen/Reid: Reid, it was wonderful to see you and Liz yesterday in Durham. You guys had picture perfect weather down here, and that Washington Duke Inn was incredible. I never would have gone of my own devices to the Duke Gardens, but it was wonderful, too, as was that restaurant place, the name of which I couldn’t remember if I had to. And this week in St. Paul for Emma’s third birthday. Man, it’s quite the travel schedule you both have. But that’s half the fun. It’s confirmed: Liz and Reid are a cute couple – his mom and sister and Liz’ sister all chimed in on the same topic. Went from Duke down Rte. 501 to Chapel Hill to see UNC. It’s a nice campus but not on the level of Duke. But I’d been wanting to see it and now I have. The ride back on two lane roads was far better than slamming it on I-85. That part of North Carolina is really picturesque although you see how the other half lives. The Road King handled great. The round trip was about 329 miles. Too bad it was a total goof up in the morning because my hands froze without the gauntlet gloves. We haven’t quite calmed down since Georgia burst onto the scene. She’s getting her entourage accustomed to her schedule. But there was a Reid (and Liz) sighting this past weekend, so you’ll read more about that next week. Ellen/Reid: Hard to believe that Georgia is now two weeks old. What a little beauty she is (but don’t all grandparents say that?). I can’t wait to get up there in a few weeks. By the looks of the photos you guys have sent, she’s already changing. That was a such a fun shot of Georgia resting on Tim’s stomach as they both snoozed. 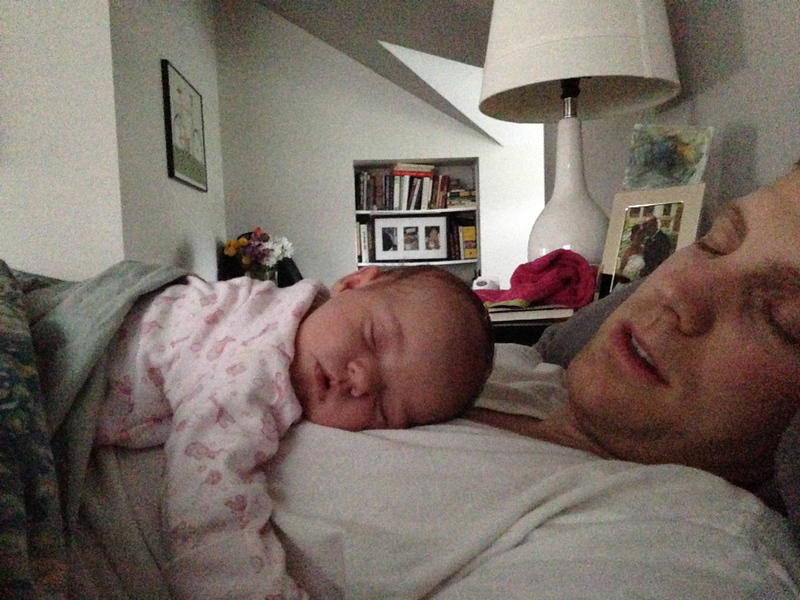 Georgia and her dad Tim get some shut eye even as the sun comes up. When you need your sleep, you need your sleep. Ellen, tell Tim that he’s already got a leg up in the garden, what with the timber borders and raised beds. I’d get the lettuce and peas in pronto since this is ideal weather for them. The tomatoes and peppers can wait a while for the temps to heat up. Reid, I’ll plan on Raleigh early next Sunday morning for breakfast with you and Liz. I don’t know your flight arrangements so keep me posted if you can. No doubt your Saturday night will be late so I can sip coffee in the hotel lobby or wherever you’re staying to wait for you. There won’t be much else on the schedule that day. The plan right now is to ride the Road King up since the high will be a shade over 80F. It hasn’t been on the highway as of yet. It’s time.